SEATTLE—Reporting that millions of customers had already signed up for the feature in the few hours since its launch, Amazon announced a new service Friday that comes to your house and kills you. 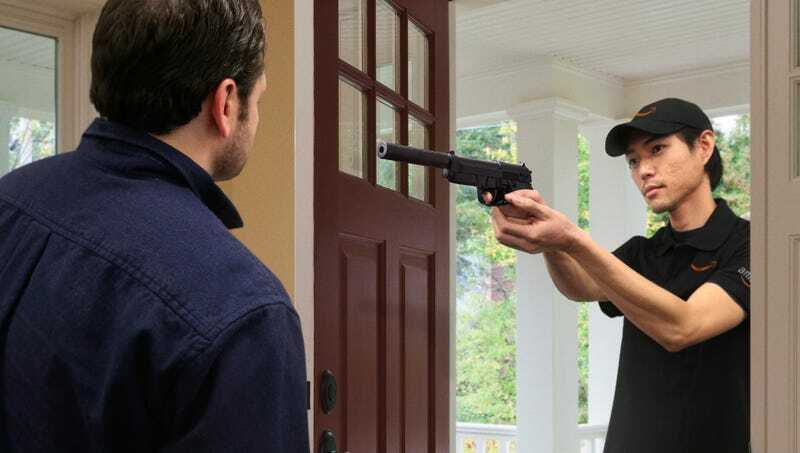 “Amazon has always offered unparalleled customer service and convenience, and Amazon Slay is part of that philosophy,” said company spokesperson Leslie Rivera, adding that the service, which allows customers to choose between being shot, strangled, or beaten to death with one of several available blunt objects, was currently only available to Amazon Prime customers but would be expanding in coming months to satisfy the unprecedented demand. “In addition to giving subscribers the choice of multiple disposal options, including having their bodies buried in a shallow grave in the wilderness or being dissolved in a barrel of acid, Amazon Slay also features real-time text alerts that let you know exactly when one of our employees will be arriving at your home to take your life, or the life of a friend or relative if you choose the gift option.” At press time, Amazon announced it was working to improve the service’s compatibility with Amazon Echo so that customers could simply have their Alexa digital assistant kill them directly.